Preheat oven to 450 degrees. Butter a 2-quart baking dish. In a large pot, cover potatoes with cold salted water by 2 inches. Bring to a boil, then add cauliflower and cook at a rapid simmer until potatoes are just cooked through and cauliflower is crisp-tender, about 10 minutes. Drain in a colander and let sit 5 minutes. Place half the potatoes and cauliflower in dish, sprinkle with half the thyme and cheddar, and season with pepper. Repeat to make a second layer. Add broth and dot top with butter. Bake until cheese is deep golden and bubbling, 15 to 20 minutes. 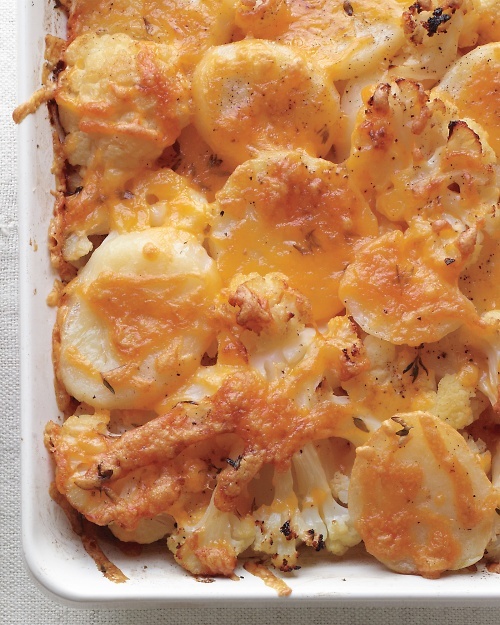 Adding cauliflower to a potato bake may seem radical, but it adds great texture. A cheesy topping is a nice change of pace from the usual creamy casserole.